The brown and gray tones of the driftwood finish greatly enhance the traditional design of this double sink vanity base. The two cabinet doors have louvered fronts which has a wonderful effect on the clean lines of the style. The dark color of the antiqued iron hardware pulls is a great accent to the finish shade. 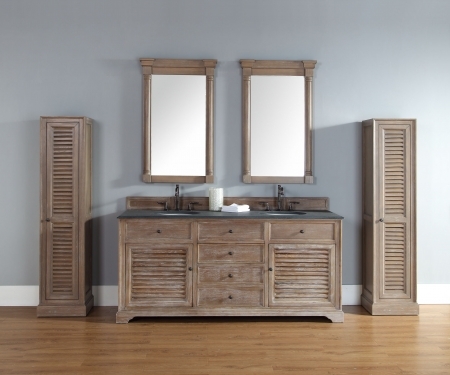 At six feet in length and about two feet in width, this piece brings ample space for storage to the room, which is always an asset in the bathroom. The interior shelf in each cabinet and the two drawers make it easy to keep things organized as well. There are several color and material choices available for the counter top for this great vanity base. Any one of them will enhance the beautiful wood finish and it is easy to get the best one to match the existing dÈcor. A matching set of mirrors would be the perfect addition to this piece. 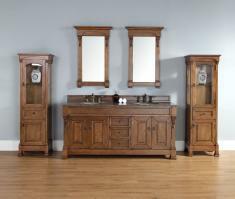 This was the second double vanity we have purchased from Unique Vanities. The picture is true to the actual appearance. The white glove delivery service again was fantastic. I wish there had a photo of the operational top drawer. I was pleased there was one although not full width due to the undercount sinks. We really liked the backsplash that matches the cabinet (as opposed to a granite one). The quality of the cabinet is a bit of lesser quality than I was expecting although its appearance is great. 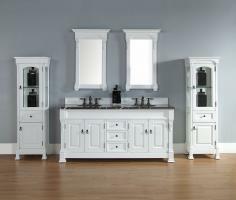 We are happy with our purchase & recommend Unique Vanities highly. 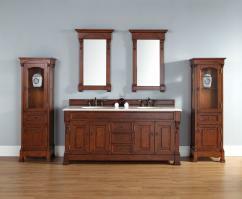 They have much more stylish vanities at a considerably lower price point than one from a kitchen/bath designer.